Welcome to IdleGaming, a place to share and discuss Idle games! An Idle game is a game where some degree of progress is made automatically. The player uses this progress (usually, but not always, a currency of some kind) to purchase upgrades or explore some other system of customization, to achieve greater rates of progress and to unlock deeper aspects of the game. /v/idlegaming has a ton of links to such games and we hope to bring our subscribers some indepth guides and reviews! I will update this post with every new game that is shared on this sub. 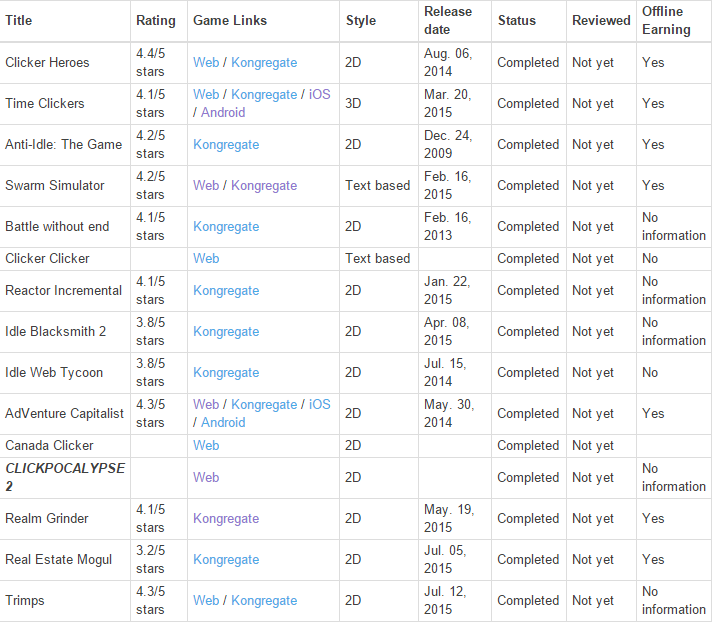 Release dates are based on when the game was posted on Kongregate. Rating is also based on Kongregate ratings. The newest game submitted to the sub will be on the bottom of the list. Titles without ratings, and in bolditalics are highly recommended. Hello there, and welcome to the update to my last post a few days back. 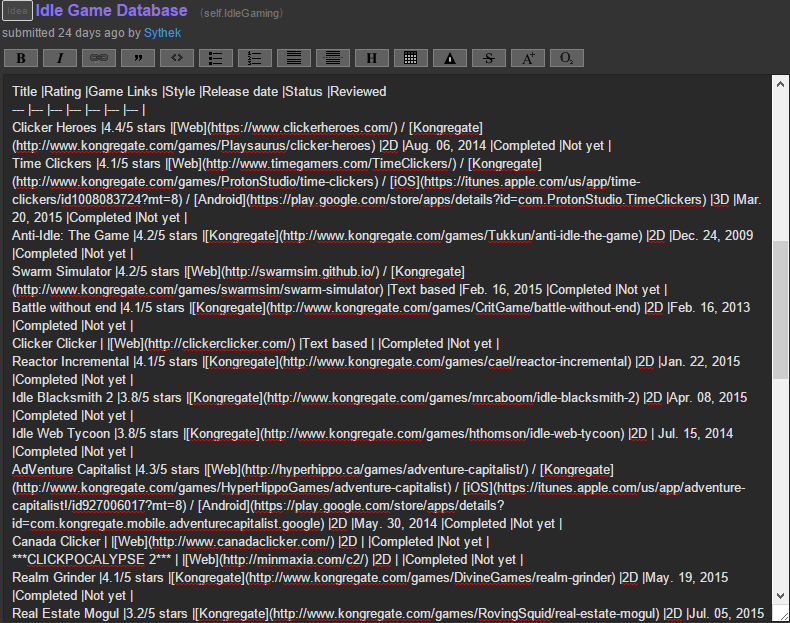 The "Offline Earnings" column has been successfully integrated into the Idle Game Database. If you find any errors regarding grammar, misinformation about offline earnings, or if you have information of some games that I don't have info of having offline earnings or not, feel free to contact me and inform me and I will correct or add the information. Thank you! So here is the question. 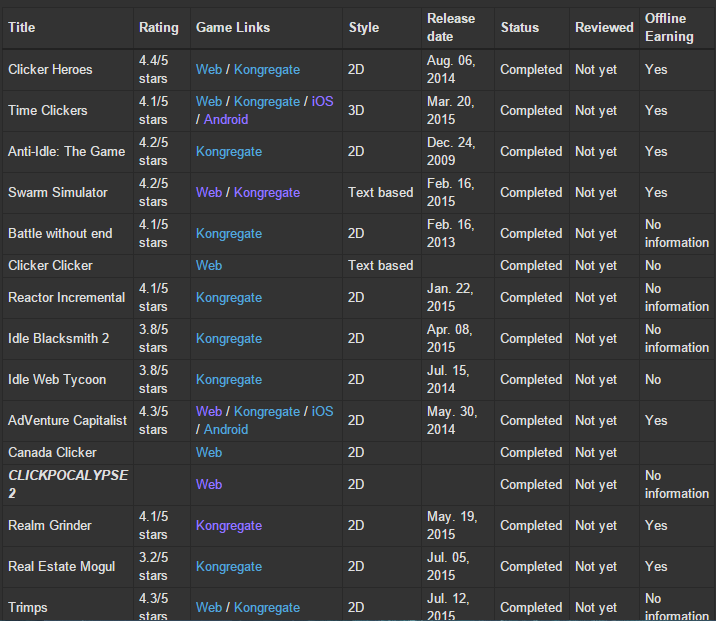 Would you like seeing a column next to the games which would tell you if a game has offline earnings available or not? Also, I'm starting to wonder how many characters can a post here, on Voat contain, and when I'll hit that limit with the database, where should I continue updating it? Any ideas? Thank you for reading, and enjoy your weekend! Edit2: Maybe change places with the two columns, "Reviewed" and "Offline Earning"